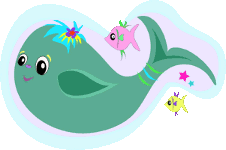 Gail the Whale lived in a small salty lake. She was the only whale in that territory, and she led a very comfortable life. In fact, this easy life made her a bit fussy. But, one year, there was such an incredibly hot summer that the lake's water really warmed up. Gail, used to such an ideal existence, could hardly stand the hot water. A little fish, which had spent some time in a child's goldfish bowl, told Gail that humans used fans to cool themselves down in summer. From then on, Gail the Whale couldn't think of anything else apart from how to build her very own fan. Everyone told her that she was overreacting, and that the hot weather would soon pass, but Gail got to work, constructing her enormous fan. When it was finally finished, she started fanning away at herself. The giant fan beat the little lake's waters so strongly that huge waves rolled right across it. The waves crashed onto the lakeshore, leaving the lake half empty, and Gail stranded in only a few inches of water. "You couldn't just hang on for while. You had to empty the lake," some unhappy-looking fish berated her. "So impatient! So selfish!" others shouted. But the worst of it for Gail was not the insults, but the fact that with so little water around her, the heat was becoming unbearable. Preparing herself to die of heatstroke, she said her goodbyes to all her friends, and they asked for her forgiveness. She assured them all that if she were to live again she would be stronger and learn to put up with life's discomforts. Yet, once again, Gail the Whale was overreacting. She managed to survive those hot days without dying, although, of course, she suffered. When the next rains arrived, the lake filled up again, and the weather improved. Naturally, Gail had to keep her promise, and show everyone that she had learned not to be so dependent on comfort, so impatient, and so fussy.